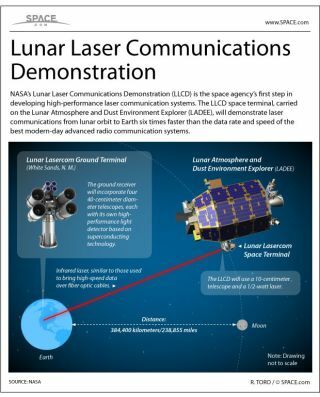 NASA's Lunar Laser Communications Demonstration (LLCD) is the agency's first attempt at developing a high-performance laser communications systemsfor interplanetary probes. The first LLCD space terminal is riding aboard NASA's Lunar Atmosphere and Dust Environment Explorer spacecraft (nicknamed LADEE for short), which is launching to the moon in September 2013. The LLCD space terminal is designed to beam data from the moon at a rate six times faster than the best advanced radio communications systems available today. The system consists of a laser mount on the LADEE spacecraft which fires a 0.5-watt laser through a 10-centimeter telescope. The data laser beam will then traverse the 238,855 miles (384,400 kilometers) between the moon and Earth to a ground station. The primary ground station, called the Lunar Lasercom Ground Terminal, is located in White Sands, N.M., near Las Cruces and features a set of four 40-centimeter telescopes to receive the signal. Other receiving stations include NASA's Deep Space Network antennas in Madrid, Spain, and Canberra, Australia.